Yehuda Glantz in an Awesome Instrumental! A pretty unpretentious name. But oh-boy, Naftali Kalfa pulled off a coup. The austerely-named Naftali Kalfa Project is no back-yard project; rather, it’s a distinctive artistic work, drawing from a plethora of artisans to produce a singularly beautiful double album. You may remember Kalfa from his previous work together with the Piamentas, on the album Yihiyu Leratzon. I don’t know his complete musical evolution, but his work there was quite decent; he was involved in composing half the songs on that record, and sings on most. His vocals are a low and gentle Sefardic baritone; not unlike Yosi Piamenta’s. But he has a quite distinctly mainstream Jewish compositional style, which has developed quite a bit since then. Let’s be clear – I was quite impressed. On this project, Kalfa dipped into a rich vein of talent to produce songs for just about every taste in the Jewish music market: from Carlebachesque sing-alongs to Piamenta rockers; Glantz salsa to Sefaradi piyut; doses of reggae and even a smattering of hip-hop. The arrangements, mostly created by the versatile Shlomi Cohen, range from solid to superb. 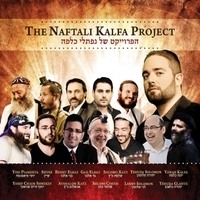 So without further ado, let’s talk about The Naftali Kalfa Project. Tov Lehodot (feat. Yossi Piamenta): ***** We begin with good ol’ rock ‘n roll. Yossi Piamenta starts things out in high gear (Yossi, wherefore art thou?!). The song has a great balance between the low and high parts – the low stanza staying soft and moderato, and the high picking up the energy, and interchanging back and forth all the way through two solos: one soft at 1:43 and a power piece at 3:53. Piamenta puts on a vintage performance throughout, and Kalfa matches him nicely with pleasant vocals. Ofer Benita on the drums lays down a solid beat, we’re treated to rock piano chords from Achiya Asher and Elad Cohen’s smooth bass. The combined effort makes for some great music and a winning opener. Zion (feat. Shlomo Katz): (****) This ballad, featuring and arranged by Shlomo Katz, ventures into Carlebach territory. It’s a sweet song that gets all the sweeter with Shlomi Cohen’s guitar solo (get used to them – they’re as much a defining talent here as Kalfa himself), and the string modulation and lyrical swap at 3:00 adds a really nice touch. With everyone swelling to a crescendo at and after 3:28, it’s a bit of swaying beauty; just too bad the guitar wasn’t a bit higher in the mix. Dror Yikra: (****) Naftali’s on his own for this classic Sefaradi sounding zemer. The rhymes fit the tune perfectly, so props there. Achiya Asher’s light piano intro becomes a theme of sorts; and while it could have developed into a nice improv movement, it sets a great tone. Shlomi Cohen’s easy mid-east guitar (ala Piamenta) sounds great as it leads into the nice harmonic finale. A fine song to use for your Shabbat table, it could have used a tad more development – possibly playback between that guitar and piano. Besimcha (feat. Yehuda Glantz): (***) Rock/rap followed by salsa?! A musical surprise there, as Yehuda’s charango replaces Yossi’s guitar. Naftali, though, is relegated to the background, as Glantz takes over with his classic multi-tiered vocalizing and multiple instruments (he’s playing charango, accordion and bass). There’s something to be said about translating traditional lyrics into native languages*, and here again, the Spanish phrasing brings something fresh to the table. A bit too much accordion, though, keeps the song a mite one-sided. *The story is told of a Chassid who would translate every word of his prayers into Yiddish. When asked why, he responded, “My Nefesh Habehamit – my animal soul – understands Yiddish better.” Yesh b’zeh mashehu. Hachazireinu (feat. Gad Elbaz): (***) A fairly standard ballad hosted by Gad Elbaz, his first of quite a few appearances here. 2:26 brings us to a beautiful pizzicato; the drums pick it up from there, and bang! Another delightful Cohen guitar solo. Asher Bara (feat. Shlomo Katz): (****) The wa-wa guitar warbling inside the solo is a nice way to start things off. Another duet with Katz in a tune that’s reminiscent of the original Shlomo (no, the more-recent-original one). The easy tune and good beat makes this one a drum circle natural. At 1:48, Achiya Asher’s keys give us a light, colorful solo, and then in comes Cohen with another of his smooth improvs. The finale might have used some percussive harmonics, but all good. Another example of excellent arrangements making the best of these songs. Hamalach (feat. Yosef Chaim Shwekey and Gad Elbaz): (***) Pretty tune, befitting the noble heritage to these lyrics. However, dunno whose decision it was to bring this group together; it makes for an odd trio. Shwekey’s bonafides as a Sefardi don’t help when he sings with an Ashkenazi accent, and the American style lullaby doesn’t match Elbaz’s unique Mizrachi vocals. At 3:45, following a beautiful instrumental bridge, we have some gorgeous violins, courtesy of Aryeh Volinez. Ten Li Koach (feat. Shyne): (*****) I simply LOVE the spooky keys/guitar theme here! What a great sound! Amit Golan gets the credit for these arrangements – superb. The fairly simple words will resonate even with those who only understand basic Hebrew. Shyne’s raps are, again, heartfelt. As with Bridges, the first time through, he keeps his rhyming short, but extends them further into the song. I think you’ll be able to identify with this one easily – it speaks for most of us, and what else would you want from a song? Yigdal: (****) A shul-worthy tune, pieced together perfectly with a reggae theme and Hammond organ. Ki Im Maos (feat. Benny Elbaz): (*****) Lyrics, composition and arrangements meet each other in a sweet way right here. What I mean by that, is that the two halves of the lyrics balance perfectly. A melancholic low section fits the words “ki im maos ma’astanu”; a positive, peppy high part matches the words “Hashiveinu Hashem eiliecha”. Benny Elbaz kicks in the harmonies, adding a ton to this cool song – especially with his rock scream at 3:28. Shloimi Cohen’s wailing guitar sounds exactly like Piamenta – another fine solo, and another magnetic song. Yesimcha (feat. Avshalom Katz, Matan Portnoi and Chaim Mamon): (*****) And speaking of songs of magnetic beauty, here’s another – hearkening back and reminding me of some of the legendary Yigal Calek’s classics with the London School of Jewish Song. Kalfa is joined by Avshalom Katz, a vocal doppelganger for Shlomo Simcha. Katz arranges this number with olde-style strings, simple trumpet, unadorned boys’ harmonies, and crystal clear piano elicit warm feelings. Fuzzy all over with this piece. Another song that’ll knock around your head all day. Adon Haselichot (feat. Shlomi Cohen and Yonah Kalfa): (***) And now we go acoustic – a plucking guitar is beautiful, but I keep expecting the song to pick up pace, and it doesn’t. Oh well. The tune, though, is very prayerful; so I understand why they went low key here. The piece at the end is a great way too slip out of the song. Ki Lo Bemoto (feat. Yonah Kalfa): (**) Another standard ballad – could have been deleted, and we’d be none the worse. Shalom Aleichem (feat. Benny Elbaz): (****) The older Elbaz returns for this salsa mix, fitting the genre with poise. If you’d have told me this was a Ladino special from 500 years ago, I’d believe you. Nice work. Ana Hashem (feat. Shlomo Katz): (***1/2) I like the second half of this song, from where it moves outside of Carlebach territory, better than the first. Shlomo (Katz, that is), once again, uses Shlomi Cohen’s guitar to break out of cliché. That, combined with some fine strings in the back thanks to Aryeh Volinez, kicks this up a notch. Refaeinu (feat. Yosef Chaim Shwekey): (***) This time, Shwekey sticks to the Sefardi accent. Man, it’s probably been said before, but he sounds exactly like his bro! However, on this record, I like his backing work better than his solo. Yet another nice song gets yet another great arrangement (the multiple modulations, in this case) to pick it up. Bar Yochai: (**) Another semi-salsa piece, with stellar horns from Adi Meiri and Shai Dagan, but this time it’s not enough for lift-off, as the tune just doesn’t have much to it. A bit too repetitive with no musical distractions. A bridge or extended instrumental solo would have helped. Niggun Eden (feat. Shlomo Katz): (***) A Carlebach-like niggun – I’m not much into these types of songs (think Chaim Yisrael’s Yamamai, et. al. ), but that’s when you need a guy like Shlomi Cohen, and to some degree, Elie Farkas’ drumwork, to tighten it all up. Consider that done. Boi Kala (feat. Ari Green and Moshe Gersht): (**) Another AshkeSfard vocal mix that doesn’t suit my taste. Gesher (feat. Yossi Piamenta and Shyne): The original Hebrew lyrics tossed in over the earlier Bridges song. Simply put, superfluous. Ha Lachma Aniya (feat. Moshe Gersht): (**) This number starts out sounding somewhat Spanish. It remains with a simple acoustic guitar, and that’s about all I enjoy in it. Gersht’s vocals are a bit too nasal for me, and the English lyrics a tad overwrought. Shema Yisrael (feat. Lenny Solomon and Evan Malach): (****) Another Shlock Rocker; fun piece. A variety of pieces come together well – the slow entree is sung softly by Evan Malach, after which Solomon and finally Kalfa add their pieces as the song picks up speed. Translating Shema literally (Hear O Israel) is a bit cumbersome, but they keep that to a minimum. Malach joins the list of great harmonists on this album, and the tune is flexible enough to allow for quite a bit of that. Lo Yisa Goy (feat. Gad Elbaz, Yosef Chaim Shwekey and Yonah Kalfa): (***) Why choose a slow tune for these words? And see my kvetch under Hamalach, above. Beautiful humming by Elbaz at 2:24, though. I Will Be (feat. Yehuda Solomon and Gad Elbaz): (*****) A Moshav sound fills the speakers – tops, in my book, for this disc. A heavy, growling guitar, Mideast rock and superb lyrics. Apparently, Gad Elbaz sings in English too – I hadn’t really known that. His and Solomon’s work fit nicely together – a match that is not expected, but now that I think about it, was a great idea, especially with this tune. Cool keys at at 2:41 give it more flashing lights, but in detail and in toto, it’s a great piece! Gam Ki Eilech: (***) Another standard, nice song. Not much unique here. Im Eshkachech (feat. Gad Elbaz): (***) Ditto to end the album. Chaval it ends on a bit of a low. So… Excellent album. As you see, in many areas, where the composition falls a bit short, the arrangements fill in. The variety of genres and guests keep you guessing; keeping things interesting. And there are just so many songs that are easy, catchy, and most importantly, honest. Many of the songs will stay with you, singing themselves in your mind throughout your day – in the best of ways. It has that kind of simplicity that tugs at you. It seems to me that many double albums have a few great songs and a lot of middling ones. Here, happily, it’s just the opposite. I do think this could have been made into one disc of 15 of the best songs, eliminating the lesser songs (most of which seemed to have ended up on the second disc), and the result would have been one incredible album, but still, it’s just a smooth, classy and very enjoyable work. With that combined with the stellar arrangements (I’ve found a new guitarist I’ll be watching out for in Shlomi Cohen), I think it’ll remain a favorite for a long time.